Angel Kemira Tevy (The Friday Angel) arrives at 03:15 am in the morning of 14 April – Cambodian time, the 2561 BE (Buddhist Era) – the year of the rooster. She is the sixth daughter of Kabil Moha Prum. 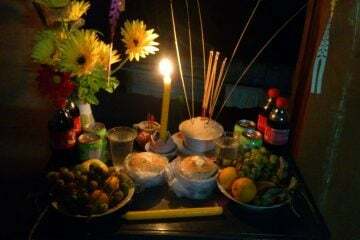 People in Cambodia have prepaired and decorated their houses also with special gifts to welcome the New Year Angel. She has got a sword in her right hand and a zither in her left. Kemira Tevy wears a hairpin with violet flowers and precious gems around her neck. Her animal for riding is the water buffalo and her favorite fruits are bananas. Beside those required offerings, you can prepare as many other offerings as you like such as: candy, cokes, biscuits, milk, etc. According to a legend, Cambodian believe that an angel comes down to earth to protect the people. Depend on which day of the week that the new year falls, determine which angel being the angel of the new year. 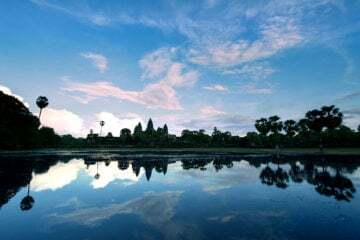 From this legend, Cambodian believe that every year on the first day of the new year or Sangkran day, there is a new angel comes down to earth (for ceremonial circle around mount Someru of Kabil Moha Prum’s heat). Each angel carries different items, has different vehicle and favor on different foods. The uniqueness of each angel are recorded in Moha Sangkran written by Hora (astrologer). So there will be different new year offerings every year. Depend on which day of the week that the new year falls, determine which angel being the angel of the new year. Below are the list of seven angels and their characteristics. May this Year of the rooster be full with happiness, health, success, love and prosperity for all! Khmer people who live in other countries celebrate their Khmer New Year around the world. We wish you all a very Happy Khmer New Year 2017! May it be full of luck, health and success! Next Article5 of the craziest foods you can find in Cambodia!